Well, the parts shopping spree was a blast to say the least. 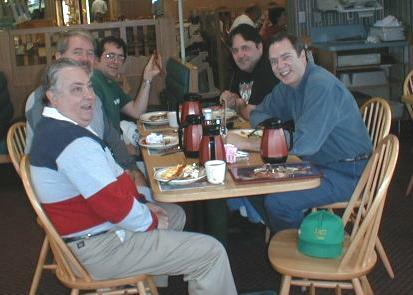 We all met for breakfast at 8:00am and the feast was on. After an hour of "Pigging" out, and great conversation we headed to Midwest Surplus. We were about an hour early getting to Midwest, Rick had his mobile going on 10 meters and was seriously going for DXCC. Diz got to show off the MiniPig proto-type to a fellow who showed up waiting for the store to open. The rest of the time was spent on more conversation, and a lot of joking around. About a quarter till 10:00 the store owner opened up early, I think it had something to do with a Geek ordinance in Fairborn that limits the number of Geeks who can hang out in front of your store waiting for it to open. So the hunt was on. We spent about an hour going over every inch of the place, we all found little treasures that we could not live without. The nice thing about Midwest is it's organized. Diz made the best find of the day, a large push button switch that he plans to use to key the MiniPig with his foot, talk about QLF. Rick bought a large selection of chemicals for etching boards, I got enough parts to build my Pixie, and then some. Dave and Tom also got various parts-n-stuff and then we were off to Mendelson's. Mendelson's is surplus hell. This is the final resting-place for all kinds of stuff that no one wants except for those of us with twisted minds. We found slot machines, fire equipment, industrial cooking equipment, and a 10Kw generator for Field Day, and this was just on the first floor. The fun stuff is on the third floor. The third floor is large, roughly the size of a football field, and packed with all kinds of electronic parts and other than a few scattered signs not organized at all. To truly look at every thing, you would need to spend two days searching and sifting through it all. Our Ht's came in real handy here. We spent about an hour here and the biggest find was made by Tom, a partial box of copperclad boards 1'X2' for $2.50 each, I bought a piece from Midwest that was 6"x 3' for $7.00 DOOH! Diz found a meter that has a centered needle that swings left or right and is marked "Left" and "Right". Rick found this very funny, and for some reason when handed to him the needle swung all the way to the right. After that we were all tired, and very happy. This trip was a blast, great people, good food, and a few hours of laughs and spending money! We plan to make this a Spring and Fall event, and hope that some of you can make the trip to join us.